Visiting the remote West Harbour Bluff. This category of boat excursion is self-explanatory. The majority of trips here visit either the coves and cliffs of West Harbour Bluff or the scenic small cays east of Providenciales, both of which are spectacular areas to spend the day. Party cruise to Half Moon Bay. If you’re looking for a fun day on the incredible turquoise waters of the Turks and Caicos, a party boat cruise may be the perfect answer. This category of boat excursion includes tours that tend to have a stronger “booze cruise” theme than the other boat tour categories, and also may not include snorkelling or visits to some of the more seclude cays and sights. Providenciales lacks the extensive party boats found at other Caribbean destinations, with the typical local watercraft being smaller vessels. There’s typically complimentary alcoholic and non- alcoholic drinks, snacks, and plenty of music. Excursions may include freshly-prepared conch salad, local rum punch, and lunch. Conch salad, traditionally created from freshly-caught queen conch, is a favourite on trips. This dish combines raw conch, vegetables, citrus juice, and herbs. The acidic lime and lemon juice “cooks” the conch. Other BBQ classics are Caribbean-style chicken, fish and lobster. Tour durations range from about an hour for sunset cruises, and up to full day adventures. If you’re visiting the Turks and Caicos with your own group, a private charter can be a great choice. There’s a wide selection of vessels to choice from, including classic sailing yachts and rum runners, catamarans, and yachts with luxurious cabins. A private cruise will allow you to tailor the day’s activities destinations how you’d like. The amazing beach at Fort George Cay is a popular boat cruise destination. 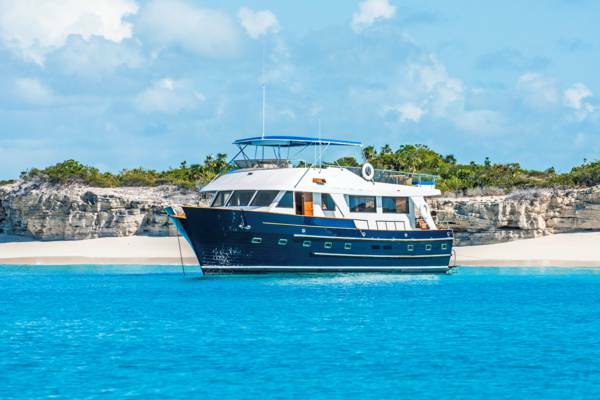 As is also the case with the island hopping cruises, party tours often visit the uninhabited and secluded cays to the east of Providenciales, including Little Water Cay, Half Moon Bay, Water Cay, Pine Cay, Fort George Cay, and Dellis Cay. These destinations offer great beaches, clear ocean water, and the unique Turks and Caicos Rock Iguana. Excursion departing from the south coast of Providenciales may stop by a different selection of sights and beaches, including the popular La Famille Express off of Long Bay Beach, and the incredible natural and historical site of West Harbour Bluff, where a small cave, rock inscriptions and a beautiful beach are hidden. 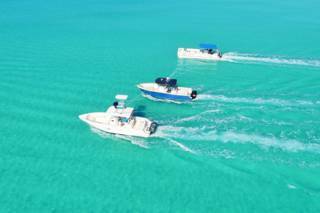 Part of the attraction of getting out on the waters of the Turks and Caicos is experiencing the unbelievable ocean hues of turquoise, topaz and blue. The north and souths sides of Providenciales each offer a different atmosphere, yet are equally beautiful. 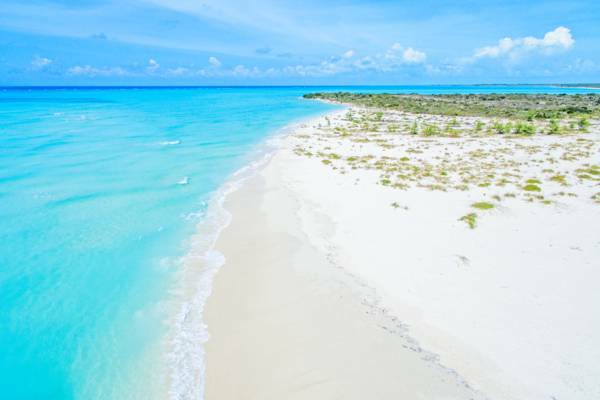 The northern beaches and cays have great beaches, bays and a reef system, and the southern Caicos Banks are reminiscent of a giant swimming pool, with shallow turquoise water a sandy bottom. Some cruises also include water sports such as tubing, where guests can ride an inflatable that’s towed in the wake of the boat. The waters of the Turks and Caicos are a great place to watch a colourful sunset, and several local tours sail to the Leeward and Little Water Cay area of Providenciales so as to be at the perfect place to see the sun go down. During the full moon periods, some of the evening tours also look for the elusive glow worms, which light up the water for a few minutes after sunset. A custom yacht charter to Water Cay. 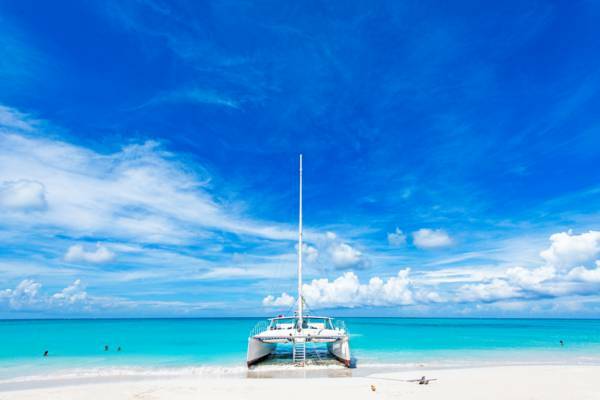 As is also the case for many other boat tours, guests staying on Grace Bay are often directly picked up by their boat on the beach, so transport to a marina isn’t necessary. Land transport for visitors staying in others areas and for excursions departing from a local marina is sometimes included with the tour package. The best rates are generally obtained by booking directly with a local tour company, as business are typically happy to avoid paying third-party commissions, and will pass some of the savings on to you. Cancelation policies vary by business and the type of boat excursions. Typically, a full refund is offered if a booking is cancelled with 48 hours or more notice. Customs charters often have more stringent cancelation fees due to the difficulty or inability of obtaining new bookings on short notice. With decades of local knowledge, Talbot’s Adventures specializes in Turks and Caicos fishing charters, boating excursions, tours and water sports with a commitment to conservation. Last reviewed by an editor on 3 April 2019.